Fuelwood (Warwick) Limited has been a specialist in firewood and timber conversion machinery since 1996. We design and manufacture our own brand of machinery for high volume kindling and firewood production, for both packaged and bulk loads. Our offices and manufacturing facility are located in a 30 acre woodland site in Warwick. 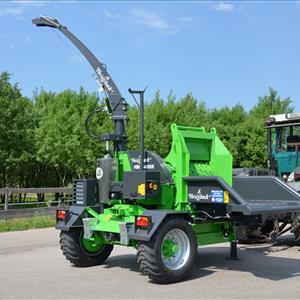 We are also sole UK importers of Japa firewood machines, Heizohack wood-fuel chippers, Lucas Mill mobile sawmills, AMR log splitters & FTG Mowi and Avesta-Vagnen timber cranes and trailers. Due to increasing demand for our products we are expanding our sales team and wish to recruit an additional experienced sales person to join our small, enthusiastic team. understanding the industry and competitive market place devising the strategies and techniques necessary for achieving sales targets. delegating duties to other members of staff as per their interests and specialisations. You will need to understand who can perform a particular task in the most effective way so as to extract the best out of each employee. using data held within the Company ACT CRM system, map potential customers and generate leads for the organisation. You should look forward to generating new opportunities for the business. brand promotion. You must make the product popular amongst the consumers through a variety of marketing techniques. motivating and inspiring all employees to work as a single unit towards a common objective and appreciating whenever they do good work. not only selling but also maintaining and improving relationships with customers and dealers alike. maintaining necessary data and records for future reference. responding to telephone, email and website enquiries for information, quotations or orders. You will prepare all relevant paperwork and record appropriate data following customer contact, ensuring all Sales Orders are forwarded to the Accounts Department for timely invoicing. holding regular sales meetings on a monthly basis with senior management. providing clear, concise and understandable verbal and written instructions for work to be carried out by others. giving demonstrations and attending shows as required. Good communication skills and proven track record are essential. Must be able to work independently but must also be a team player. Salary range subject to experience and qualifications.